This is one of Ilga's original pieces (© Ilga Leja), as is the one you see in the first photo and the remaining ones. I enjoyed this one tremendously! I found Arpeggio by Ilga Leja to be interesting enough to engage me while being a perfect TV-watching or friend-chatting item as well. 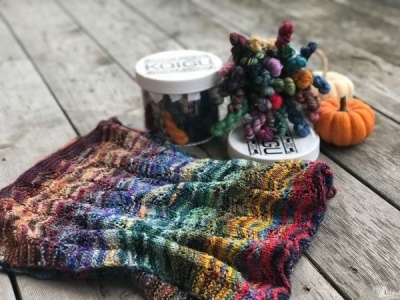 I took full advantage of the Noro yarn with its slow color changes and knit the entire wrap in one colorway, allowing the color changes to form the design while I day-dreamed along. 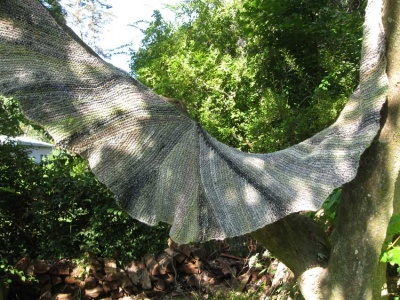 Please note that you must get the pattern itself from Ilga on her Ravelry page. What we offer here is the yarn as described below. 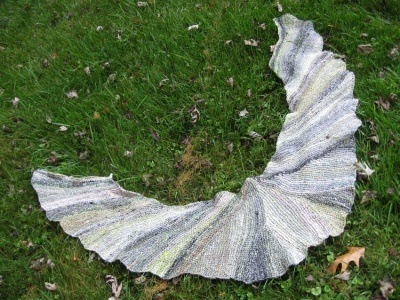 A long, curving shawl that falls like a musical cascade. 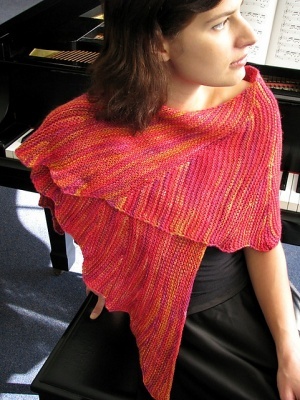 It is worked entirely on the bias in Garter Stitch with short rows throughout. Its unique construction allows it to be worn in many different ways, as a shawl, a scarf, or capelet. Work it in one colourway or choose two contrasting colours that highlight the short row construction even more. We are not offering the yarn nor colors that Ilga used for her original. Ilga suggests DK weight yarn, about 711 - 744 yards (650 - 680 m). 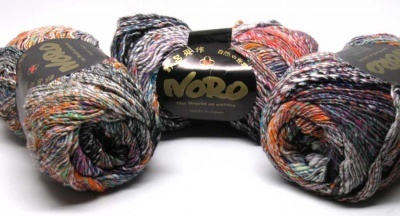 What we have is from Noro, the yarn called Kibou. 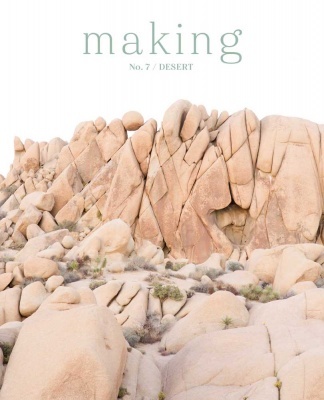 Each skein is 297 yards (270m) per 100 grams and is composed of 54% cotton/ 34% wool/ 12% silk. Each kit will have three skeins, enough and a bit more than you will need. The yarn is plied and the overall look is quite tweed-ish, with the long color runs being quite subtle indeed. On this web page we show some pieces as knit by Ilga and also one that I knit for myself from one of the colorways we offer. You can see how the colors change in those. Kit B: This is color #15. A bit warmer, the main colors that stand out here are ecru, black, red, and orange, with some green and small quantities of blue as well. Kit C: Color #14, a sandy look with rich fuchsia and violet standing out and also some areas of green and teal and yellow besides. 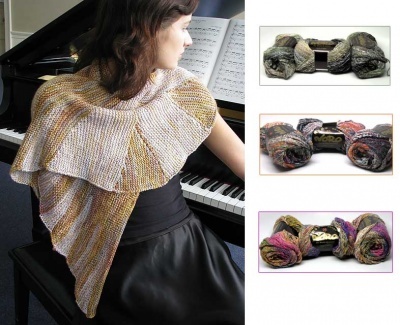 Remember that the pattern must be gotten directly from the designer here on her Ravelry page. This will ensure that you get all updates and help that evolves with the design. The kits consist of these lovely yarns only.